The drinks giant will release its own Irish blend this March. GUINNESS-MAKER DIAGEO will produce its own whiskey blend from a new distillery in Dublin as it looks to capitalise on the success of the fast-growing category. The company plans to launch a new brand, Roe & Co, on the market this year, with the whiskey set to be released in early March across Europe. The whiskey will be produced at a distillery to be developed in the former Guinness Power House on Thomas Street. The new facility at St James’s Gate is still subject to planning approval. If the project is approved, Diageo expects the distillery will take three years to complete and cost €25 million. Production on the site is expected to begin in the first half of 2019 – meaning the first whiskey distilled on site won’t be available for sale until 2022. Diageo operations director Colin O’Brien said that in the long run this will be another boost to tourism in The Liberties area. The region already boasts the operational Teeling Whiskey Distillery, while the Pearse Lyons Distillery and Dublin Liberties Distillery are both in development. The new whiskey from Diageo is named in honour of whiskey maker George Roe, who is credited with bringing about the golden era of Irish whiskey in the 19th century. O’Brien told Fora that the distillery will only be producing the blended malt part of the whiskey, with the grain whiskey component sourced from other Irish distilleries. “Effectively we wanted to create a fantastic luxury whiskey that is a blend, so our master blender Caroline Martin has sourced the different whiskies that will help form the blend. Diageo already produces a number of scotch whiskies, such as Johnnie Walker, Buchanan’s, Windsor and JεB. The firm also makes Crown Royal Canadian whisky. O’Brien said Diageo will engage with stakeholders in The Liberties area over the next few weeks and the company expects to get planning permission for the project within the next six months. The Irish whiskey sector has been going through a resurgence in recent years, with exports growing by almost €215 million over the past decade. According to the Irish Whiskey Association, this represents a 300% increase on levels seen 10 years ago, which made Irish whiskey the fastest-growing spirits category globally between 2009 and 2014. The resurgence in Irish whiskey has also coincided with a number of new distilleries opening nationwide. At the start of 2013, only four distilleries were in operation in Ireland, but now there are 16 distilleries in production. There are also 13 new facilities at the planning phase and it has been forecast that investment in new distilleries between 2010 and 2025 will reach €1 billion. The boom in extra whiskey producers has led to warnings from some senior industry figures that many new distilleries could struggle to become commercially viable, particularly due to the three-year maturation time needed for a product to be sold as Irish whiskey. 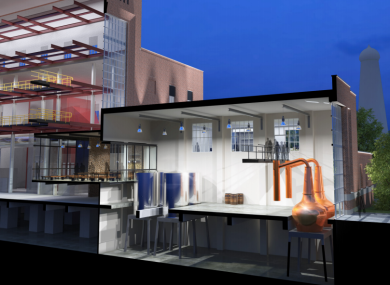 Email “Guinness-maker Diageo is building a Dublin distillery to create a 'luxury whiskey'”. Feedback on “Guinness-maker Diageo is building a Dublin distillery to create a 'luxury whiskey'”.